_ more than half the world's bird species. The precise meaning of the word passerine is "sparrowlike," and a common, though possibly misleading, alternative is "perching birds" (many non-passerines perch). A third name, not always deserved, is "songbirds." 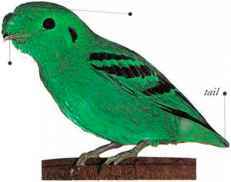 Most passerines arc relatively small, and there is a basic similarity of shape throughout the group. Identification may depend on minor details. 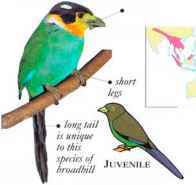 Legs vary according to life-style, for instance, whether the bird forages on the ground or perches in foliage. Bill shapes vary with the food eaten - most commonly insects, fruit, or seeds. The shape of body, wings, and tail help too, and song can often be decisive in identifying a passerine species. Small groups feed in the under the crest lower branches on soft fruit, buds, and occasionally insects. • NEST A pear-shaped structure with a porched entrance hole at the side, hanging from a branch.